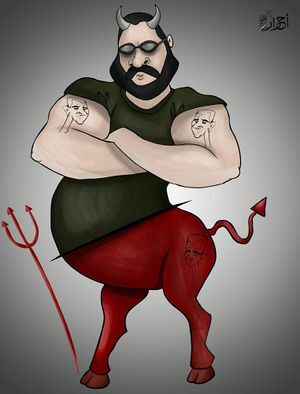 The Shabiha (singular Shabih), also known by other transliterations like "Shabbiya," versions with a "ch" beginning, and even "Hbih") are, well... as generally understood, they're a network or mafia of Alawi (Alawite) militias loyal to the government of president Bashar Al-Assad, who shares their religion (Alawi'ism is a little-understood offshoot of Shi'ism). The word "Shabiha" is generally translated "thugs," but apparently derives from "ghosts" originally or, perhaps, from the local militias the men referred to actually belong to, or to a couple of other things, perhaps combined for clever effect. (See below, Etymology.) No one seems to know for sure. Among other acts of violence and repression, the Shabiha - especially the Alawite ones around Homs and Hama - have been blamed by the opposition for most or all of the most horrific civilian massacres of 2012 and 2013. (See below, "Shabiha Massacres".) There are however doubts that appear case-by-case about the truth of these crimes, as well as doubts about the Shabiha in general - to what extent does this dismembering ghost army version of the Shabiha even exist? Please note, this page no longer only a stub, but still lacks exploration of many vital areas. See the discussion page to see, or add to, more detailed content awaiting proper inclusion. Even that still remains inadequate, but it's a start. The meaning in parentheses of the word Shabiha is usually given "thugs." This seems more a description of what they are, with no linguistic connection. Shabiha does not mean thugs, and in fact has no prior known meaning, being a new word, invented in Arabic in the year 2011. What it does have is several possible linguistic origins that have been proposed. There is not necessarily any one correct origin, especially as it’s not quite any one of these words. Any combination of these or other, unlisted origins, could be why the term was invented, by whomever first, to describe this apparently new force in the Syrian conflict. Shibah (Ghost): The Arabic word is شبح , which is pronounced Shibah and means "Ghost," is the most widely-noted origin, too common to bother citing sources for, aside from Daniel Bode, Middle East Online  and the BBC. The slight distortion to Shabih is unexplained. Shaa'biya (Popular): Aziz Nakkash issued a report in March 2013 on the Alawite/Shabiha "dilemma" in Hama, apparently after meeting several there. He mentions a strangely plausible origin no one else has, popular committees or, in Arabic, "اللجنة الشعبية" Lijan Shaa'biya. By the end of 2011, these had "slowly disappeared – or, to be more precise," merged with "the army and the secret service to fight in neighbourhoods held by the opposition," and so they "became the Shabiha." Nakkash does not, however, suggest Shabiya as an origin for the name Shabiha, even as the one emerged right from the other. Consider also Wikipedia's Shabiha page and flanking not-quite Shabiha entities surrounding this "Lijan Shaabiya" model: Jaysh al-Sha'bi (only emerges late 2012 and on, however, and organized by Iran and Hezbollah, says the US) and "Lijan militias" on Wikipedia, seeming to be exactly "Shabiha" of the "visible" type, including "the Sunni Muslim Arab al-Berri tribe of Aleppo." Side-note: While it's apparently a made-up word with no set, direct translation, the singular form Shabeeh شبيح , now has a recognized meaning according to some translation services. Facebook's built-in Bing translator once (rendering this post) turned شبيح into "being annoying and concealed," while Bing Translate alone gives simply "being annoying." How and why that happened is unclear. Google translate just repeats the Arabic, meaning unknown. There are two types of Shabiha to consider, both of which could be the same or could not. Visible: The actual pro-government militias, supported by some evidence, with members who speak for themselves sometimes. Invisible: The Shabiha of the horrific massacre, always spoken of by the rebel first responders who always seem to be just a step behind these shadowy villains. Never seen in action, the invisible Shabiha are best known for massacres of rural Sunni families and villages, at least as rebels explain it (see examples below, Shabiha massacres). The best name meaning for these is between Shibah and Shabaha: dismembering ghost army. Whatever the rebels say, there is usually compelling evidence that these killers are not the same people fighting with the government, but rather concealed black ops and false flag units on the anti-government side. One article from May 2011 was already explaining the term in English, at the time mostly just shooting randomly at protesters. Otherwise, it wasn't commonly used in western media before late 2011. The dates of creation of the different wikipedia "Shabiha" articles might be of interest here. The oldest one is the Arabic one, from late March 2011. The English one is from August 2011, the German one from December 2011. In Farsi and Turkish people didn't bother writing about the term until early 2012. Men close in space and time to the Houla massacre perceived as mean enough looking to be the perpetrators. They wear white sneakers. They're called Shabiha in a France 2 documentary. According to some alleged survivors of the Houla massacre, the Shabiha attackers were bald-headed and bearded, no specified build, wore unspecified civilian clothes with white sneakers, joined in Alawite chants, stomped on a koran, specified to their victims where they came from (primarily the tiny town of Al-Fullah), and perhaps had Alawi slogans on their foreheads. Footage sent to the SOHR shows 4 members of the security forces being detained by rebel fighters in Reef Aleppo. Some of the detainees seem badly injured. The person behind the camera states that the prisoners will be beheaded because of their acts. 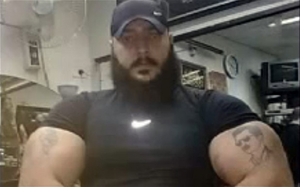 The July, 2012 mass-execution of alleged "Shabiha" boss, Ali Zein Al-Berri and dozens of his men, might support this: the only source specifying a sect says the Berri clan is large, powerful, and Sunni. This supports the notion that essentially the real people rebels refer to and intend "justice" for started as local, sometimes tribal, self-defense committees of whatever sect that probably call themselves something like Lija Shabiya, popular committees. Alawite men (aka Shabiha) promise resistance to the rebels in Latakia. The alleged Alawite militias are credited by anti-government sources with a number and variety of crimes, but nothing stirs the world's imagination or spurs our scrutiny like a reported Shabiha massacre of men, women, and children in the Syrian countryside or a contested city district. There have been so, so many of these, especially in and between Homs and Hama, that it's heartbreaking to an exponentially compounded degree. Collectively, the reported number of victims of these massacres count far into the thousands. However, some rebel battle dead are frequently lumped into the tally as well, sometimes in fact providing the vast bulk of casualties (see especially July 12, 2012; August 24-28, 2012; January 15/16, 2013; and Mid-April, 2013). This reduces the number of slaughtered civilians, sometimes drastically, from what rebels reported. The following is a partial list of just some of these horrible events, in chronological order. Listed are perhaps all of the largest alleged massacres blamed partly on Shabiha, most of which (those with bolded/linked titles) we have covered to some degree here at A Closer Look On Syria (ACLOS). As you can see, our main blind spot at the moment is events prior to the May, 2012 Houla Massacre. Notes: "Reported" means rebel/activist reports, usually upon finding the bodies, which are always left behind for them to find. "Children" seem to be defined usually as those aged 12 and under, meaning the number of what much of the world calls children could be higher yet. "Killed" as first mentioned (rebel claim) usually means brutally executed, civilians, and almost almost universally of the Sunni sect. But again, battle deaths also get mixed into these totals. Late January, 2012 : Shabiha record their own Homs massacre, rebels later found and published "Syria Shabiha Cell Phone Secrets - Self Video of Homs Massacre"
Mid-March, 2012: Karm al-Zaytoun Massacre: 45 reported killed, mostly women and children, in theKarm el-Zeytoun district of Homs, plus other districts, and on the day before ... horrible killings, blamed on Shabiha, partly in Alawite districts, largely in districts with only a few Alawites. May 25/26, 2012: The Houla massacre: 108 reported killed, 49 of them children, by in-home executions of a few targeted families. This was by Shabiha and the Army, and followed violence rebels and their supplied witnesses describe as a regime assault that forced rebels far away from the massacre sites. Other witnesses, supported by rebel-supplied video evidence, suggest the preceding violence was instead a successful rebel assault, and someone on the rebel side did the massacres. "We heard a tank on the street and men on a car who were chanting: 'Shabiha forever! With our blood and our souls, we sacrifice ourselves for you, oh Bashar!" … “they found this Qur'an. They grabbed it and started stepping on it." … “They cut off the throat of one soldier and threw him from the 3rd floor … they told him: “now you remember you’re a Sunni?" June 6, 2012: Mazraat al-Qubeir massacre: 78 reported killed and burned, rebel fighters maybe included, as they lost a battle there. Verified: at least 19 civilians, 3 women, 10 children minimum. "Shabiha militiamen entered the hamlet armed with sticks, guns and knives. They attacked homes and farmhouses, shooting and slaughtering all the inhabitants they could find." - "militiamen danced over dead bodies while singing pro-Assad songs." Late June, 2012: Douma Massacre: "[Rebels/opposition] displayed gory scenes in homes they said had been overrun by pro-government "shabbiha" paramilitary gangs, after army shelling over the weekend forced rebel fighters to retreat." Hundreds were reported killed, dozens at least seen rotting in the streets and pulled out of homes and basements, and in pats from trash bins, rebels claimed. The government would generally fail to retain control of Douma, leaving its homes most accessible to rebel fighters and their allies, before and after this incident. July 12, 2012: Tremseh massacre: "Activists and witnesses said shabiha militiamen swept into the village after the bombardment. Many people were shot or stabbed, and dozens of bodies were burned or dumped in the streets, they added." Tremseh is generally accepted now, even in the Western mainstream, as a rebel defeat after the army arrived. Despite early rebel claims there were no rebel fighters there at all, most of the dead were clearly just that. But there does seem to have been a smallish massacre of civilians, apparently before the army arrived, that somehow went ignored after the battle. August 24-28, 2012: Daraya massacre: Different hundreds of people, 400-1,200+, reported killed. This made big news again as the single largest mass killing yet, widely reported as 600+, or about six times the size of the Houla massacre. The victims were reported killed over a couple of days, as rebels lost a huge battle for this crucial suburb of Damascus. As they died and fled, it seems rebel brigades also "let go" of some civilian hostages, and gunned down some random people in traffic, all greatly cluttering the scene. A bereaved mother of a killed rebel fighter: "I will not forget my son, and I swear that I will raise his 3-year-old son to take revenge for his father from those Alawite shabiha and soldiers who kill our husbands and sons." Late August, 2012: Harak Massacre: The UN Human Rights Council, citing rebel sources, found "reasonable grounds to believe that Government forces and Shabbiha, committed the war crime of murder" in Al-Harak. Rebels say 565 people were killed, including only 30 rebel fighters. Many were women and children, somey executed with guns or knives and burned, according to one plausible-sounding “FSA fighter” the Commission spoke to, who “moved into areas following Government forces” and personally saw and counted around “400 civilian corpses.” Like Daraya, this coincided with several days of rebel defeat as the government re-took this crucial suburb of Deraa. September 26, 2012: September 26, the Deadliest Day: 40-107 in Al–Dhiyabia, 18 in Al-Bayada, Homs. Banyas: unclear, Bazreh: 19, etc., adding to various battle deaths to give the deadliest day yet, by many counts 343 people killed in Syria fighting. Bazreh, Damascus: "15 martyrs' names were documented in a massacre committed by shabbiha in the neighborhood and most of the victims were children and women." October 23, 2012 Douma Massacre: "More than 20 civilians have been slaughtered by (pro-government militia) shabiha who were at a checkpoint and then stormed into a residential building nearby." December 10/11, 2012 Aqrab Massacre: 125-150 or up to 233 killed, women and children included, details unclear. They were Alawites. Those Alawite hostages who escaped don't know what happened to the rest, but whatever it was, rebels did it. "Shabbiha Massacre Alawite Women and Children in Aqrab, Hama" - "Activists said the [Shabiha] militia-controlled building was being besieged by the rebel Free Syrian Army (FSA)" - "There were 200 people inside and we called on the residents to leave, but the Shabbiha held some women and children by gunpoint. Eventually talks fell apart and the government shelled the building...” - "“the armed gangs attacked them, from Al-Houla and Aqrab. … where they took them, we don’t know. … this is our problem. They have all sorts of weapons.” - "They’re burning tires inside the building to suffocate them. There’s no water, no food. Perhaps 3/4 of the people there are already dead by now." Late December, 2012: Maan Massacre: 23 reported killed by beheading, including 7 children, from the Sunni minority in a majority-Alawite town, following extremist Sunni rebel attacks there. "Opponents of the regime reported on Tuesday that members of the Shabiha militia in the village of Maan, in Hama province, have beheaded 23 people. " - "Shabiha from everywhere ... entered the village of Ma'an and committed horrible massacres against our brothers the Sunnis, who make up a small percentage of the village…"
January 15/16, 2013: Haswiyeh Massacre: 106 reported killed and burned, from families, but one list of 100 names had only 25 women and children. 75% male suggests most of the rest are rebel fighters. Locals say around 30 civilians were massacred by rebels in black before the army came and killed "many" of the Islamist fighters, possibly with Jabhat Al-Nusra. Activists blamed Army and Shabiha. "[A] Few of the young men were able to escape as they climbed on trees and hid in orchards. But the regime's Shabiha (thugs) caught them, executed them and tied them to trees." - "rebels in black uniforms had come to the house and wanted to use the roof to attack the base. Many of the locals had refused. At that point, say the men, they were shot." March 25, 2013 Abel massacre: Up to 21 civilians killed, hacked up, beheaded, etc. and burned, 13 visually verified, just south of Baba Amr, Homs, the day after rebel forces were fully chased away from there. "The regime’s shabiha attempted to storm Abel village in the suburbs of Homs, and the Free Syrian Army fought them back. As the shabiha were withdrawing from the area, they arrested two entire families … then filmed the detainees, forcing them to say that it was them who saved the civilians from armed gangs. 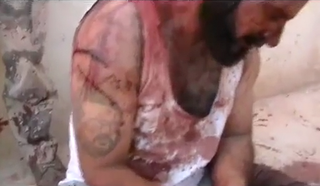 After they completed filming, the shabiha tortured the civilians in the most brutal of ways." It was rebels from Baba Amr who had the video proof afterwards. A second incident with eight mangled and charred victims was again filmed by the same rebels four days later (same link). Mid-April, 2013 Jdeidat Al-Fadel Massacre: 566 claimed killed, during attacks on/re-conquest of this Damascus suburb. "...despite the FSA’s withdrawal to save civilian lives, the regime mobilized large numbers from its 4th Division, Republican Guard, Lebanese Hezbollah, and shabbiha militias from the Somarieh barracks to storm the city and attack civilians. Many of the casualties were women, children, and elderly persons. Some victims were slaughtered..."
May 2-4, 2013: Al-Bayda Massacre and Baniyas massacre, Baniyas area, Tartous province, at least 150 civilians reportedly killed. BBC: "In al-Bayda, at least 50 people had been "summarily executed, shot to death, stabbed or set on fire" on Thursday, (the SOHR) said. The killings were carried out by government troops, supported by pro-government militiamen known as "shabiha", it added." Not mentioned: 36 of the dead belonged to the family of the town's imam, Omar Biassi, a government loyalist whose last act was trying to talk the rebels into releasing some 30+ captive "Shabiha." "He said his chain of command knew exactly what had unfolded in Baida and Ras al-Nabaa. "It was the regime loyalists who did it, from the surrounding Alawite villages," said the official, who did not want to give his name. "But they were not acting under orders. They carried it out on their own accord. The leadership has all the names of the perpetrators, but now is not the time to punish them for the crime." Otherwise, these crimes are only ascribed by rebels to the local Shabiha, with no sort of confirmation from them even alleged. And this coexists with frequent signs of varying clarity, in those cases we have studied, that some concealed black ops/false flag units on the opposition side are actually to blame for the nasty stuff (some such clues explored at each of the linked ACLOS pages). This page was last edited on 2 December 2013, at 07:00.